If you are looking for some effective ways to fit and active your body? 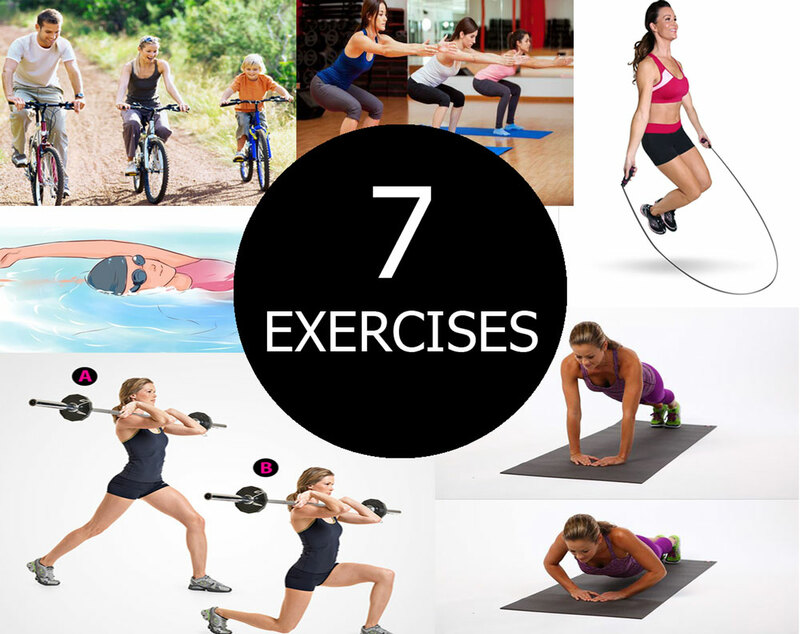 We will describe 7 great exercises that will help you to reach your fitness goal. These exercises are easy but really very effective in strengthening you along with burning unwanted calories. However, sticking to these exercises is not enough to transform your body, you must eat healthy food and get enough sleep regularly. Don’t waste your precious time doing other workouts, here are few exercises that will help you transform your body in really minimum time. The benefit of Jumping rope? Ahh Jumping rope, we played it in our childhood! – is your first thought about Jumping rope. Jumping rope is easily portable and a cheap exercise that you can do almost anywhere. This workout burns more calories per minute than any other workout. So, get jumping for a perfect exercise and plenty of fun by remembering the childhood memories. One of the best things about jumping rope is that you can do it with your kids. Moreover, jumping rope is a fantastic way to fit in a highly effective cardio session when you are on the go. Simply toss your jumping rope in your carry-on and you don’t need to look for the nearest gym. So, who said jumping rope is only for kids? It’s for all the members of your family. Squat works for more than one muscle group. This powerful exercise helps tone your glutes, strengthen your body and burn a lot of calories. To boost your calorie expenditure and raise your heart rate, you can try to do jump squats. Or stay in a squat hold with dumbbells in the hands to increase the resistance as well as feel the burn. Doing squats regularly is one of the best ways to transform your body as well as improve your physical health. If you sit all day at work or at home, you are at higher risk of serious disease. Why not do several squats whilst waiting for your dinner to cook, the kettle to boil, or your PC to boot up? Sometimes multitasking is a great thing! Unfortunately, many people avoid doing push ups since this exercise is a bit harder to perform, but it can do wonders for your body. There are plenty of different push-ups that work the different muscles in the shoulders and arms. Try to vary your push up style to lower your risk of becoming bored with exercise. Not only do pushups work the upper body, but also work the core. Do push-ups a few days a week to help sculpt the arms and overall transform the body. Plus, pushups are good for your heart and cardiovascular health and this exercise helps to improve your posture. Just make sure you do them correctly – learn to do pushups with your back straight to reduce back pain and avoid straining your back. They isolate every leg individually, helping transform your body. To add some cardio and boost the intensity, do some jump lunges. To tone, the muscles in your legs try doing lunges. I suggest you do 3 sets of 10 lunges a day for the best results. Since lunges are a very effective workout for strengthening, sculpting and building a few muscle groups, why not do them every day? Even if you have a super busy schedule, you can still find time to do several lunges. Stop making excuses and start exercising to transform your body today.